The 1860 United States presidential election in New York took place on November 6, 1860, as part of the 1860 United States presidential election. Voters chose 35 electors of the Electoral College, who voted for president and vice president. 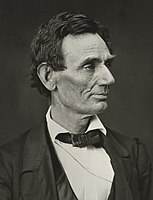 New York was won by Republican candidate Abraham Lincoln, who defeated the Democratic fusion ticket. Lincoln won the Empire State by a margin of 7.42%. New York in the election was one of the four state that had a fusion ticket for the Democratic Party. The other three states were New Jersey, Pennsylvania and Rhode Island. ^ "1860 Presidential General Election Results - New York". U.S. Election Atlas. Retrieved 3 August 2012. This page was last edited on 15 March 2019, at 00:22 (UTC).